Maybe you’ve played Scrabble online with your friends via Facebook. Or maybe you’ve played the extremely popular Scrabble game on the iPhone. 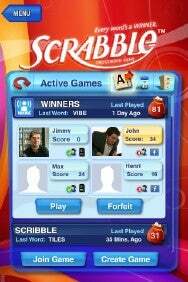 On Tuesday, EA Mobile announced the ability for Scrabble to communicate with Facebook. This Facebook Connect upgrade will be free to anyone who has the Scrabble iPhone application. Scrabble for iPhone and iPod touch now lets you play with your Facebook friends. Travis Boatman, EA Mobile’s vice president of worldwide studios, provided a demo to me at the Game Developer Conference that’s happening in San Francisco this week. I watched as my friends’ Facebook profile pictures would appear on the list of available games. I could also check out their stats on the game and invite them to play or invite friends of mine who don’t have the app to download it and play me. Making a word on Scrabble will appear on my opponent’s board almost instantly. You can play games in real time or take turns at your leisure and play multiple people at once. Of course, the new Facebook Connect upgrade also allows for chat between players — ensuring you can trash talk with your friends at home while you’re on the bus. Many leading experts have said that the future of the iPhone lies in its social features. EA Mobile has bridged two of its popular versions of the game in a social marriage that promises to bring new players to the addictive word challenge game and give existing players new ways of interacting.